A family in pain needs your help. Last September, a man was killed riding his bike on PCH in Malibu. Word has just now reached his family in Memphis, Tennessee, who lost touch with him after he left the city and apparently moved west to the Los Angeles area. They’re hoping that anyone who knew Neville Williams will contact them to provide whatever information they can to give them a little closure. You can find his full comment here, along with his email address. 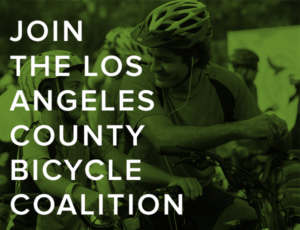 Bike the Vote LA strikes a three-way tie for their endorsement in race for LA’s 7th Council District between Monica Rodriguez, Fred Flores, and Jose Castillo. You can see their responses to the Bike the Vote questionnaire, along with fellow candidate Connie Saunders, below. A new attempt is underway to eliminate the unsafe and confusing requirement that bike riders must ride as far right as practicable. 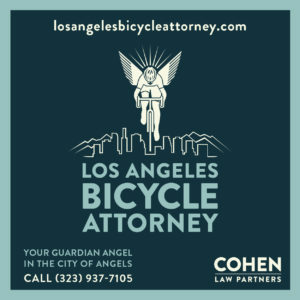 Which LA County sheriff’s deputies routinely misinterpret as meaning a) cyclists should ride on the shoulder instead of taking the traffic lane, and b) riding two abreast is not allowed, since the outside rider is not riding as close to the curb as practicable. Never mind the many exceptions to that rule under CVC 21202, or that the shoulder is not legally part of the roadway. 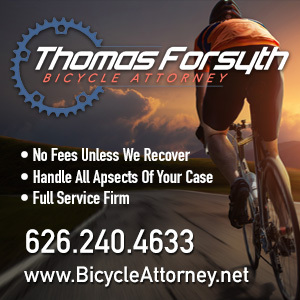 Under AB-694, the new rule would clarify matters by saying that bicyclists “shall ride in the right-hand lane or bicycle lane, if one is present,” unless the lane is wide enough to safely share with a motor vehicle. And doesn’t change the fact that riding abreast is not prohibited, or even mentioned, under California law. There was some concern that this bill would eliminate the exceptions allowing riders to leave a bike lane under current law; however, it would not change CVC 21208, which provides a number of circumstances where the requirement to use a bike lane does not apply. More fallout from the Malaysian massacre, in which eight teenage bike riders were killed in a collision with an alleged speeding and distracted driver, and another eight injured. A Malaysian paper follows-up on the deaths of eight teenagers riding bicycles modified to look like motorcycles, placing blame on a lack of safe places to ride. The president of a parent-teacher association calls on the state to build a bike racing track where younger riders can blow off a little steam. A state executive urges people to stop blaming the parents of the victims on social media, and leave the questioning to the police. And a former government minister is accused of politicizing the tragedy. British cycling champ Chris Boardman calls three-time Tour de France winner Chris Froome a statesman for rising above the country’s doping controversies. Lance thumbs his nose at the government lawsuit over doping when he was with the US Postal squad by competing with his former fellow-doper teammates in the unsanctioned 24-Hour Old Pueblo mountain bike race in Tucson, finishing third. A new study concludes Los Angeles is the world’s most congested city — although other studies would disagree. Building our way out of traffic has clearly failed; if Los Angeles is going to survive — let alone thrive — it has to offer safe, convenient alternatives to driving, while increasing density to reduce the need for long commutes. Despite rumors to the contrary, Caltrans has not approved plans to add a right turn lane on PCH at Cross Creek Road in order to accommodate a planned shopping center, which would eliminate the shoulder used by thousands of cyclists every weekend. The Register’s David Whiting considers the state of OC’s trails following the recent rains. The fire department airlifted an injured hiker from Runyon Canyon this past Sunday, a reminder that trails can remain unstable even days after the rains. Sad news from Fresno, where a man on a bike was killed by an Amtrak train Monday afternoon after going around the crossing arms. As we’ve said before, never, ever go around the gates at a railroad crossing, even if it looks safe. PeopleForBikes celebrates Presidents Day with photos of past presidents riding bicycles, including the only color photo of Abraham Lincoln on a mountain bike. That’s past presidents, since our current chief executive swears he hasn’t been on a bicycle since he was a child, and isn’t likely to anytime soon. Bicycling offers a beginners guide to riding in traffic. Utah’s plans to remove protection from a pair of national monuments has cost it a trade show for outdoor retailers, as well as a chance to host the Interbike trade show. A Texas man has traveled over 8,000 miles through 31 states with his dog since 2013 to promote non-profit animal shelters and discourage puppy mills. I can relate. The Corgi overcame health and socialization problems from being shipped to a wholesaler when she was just six weeks old, and came to us through a non-profit rescue when her first owner couldn’t care for her anymore. A 78-year old Minnesota woman has ridden her bike across the continent four times, as well as riding to Cheyenne WY for both her 50th and 60th high school reunions, despite not taking her first long-distance bike trip until she was 60. Falling off her bike led to twin silver medals for an upstate NY woman with MS at last year’s Paralympic Games. 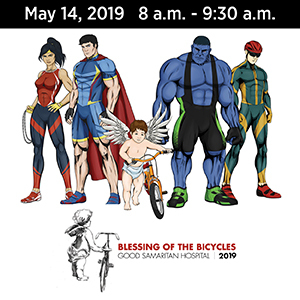 Big step forward for Pittsburgh bike icon Danny Chew, as he takes to hand cycling for the first time since he was paralyzed from the waist down in a September riding fall. A self-described bike lane vigilante literally takes the law into his own hands, slapping homemade parking violation stickers on cars and trucks blocking Philadelphia bike lanes. A DC bike columnist discusses whether hi-viz really does any good. Bike Radar looks at 12 “madcap” cycling records that aren’t likely to get broken anytime soon. Police in Manchester, England crack down on inconsiderate cyclists, ticketing 41 riders over a two week period. Even though they say drivers committed traffic violations at twice that rate. Where to stay on your next bike tour of Scotland. France is offering up to 700 euros towards the price of an ebike — the equivalent of $738 — as part of a two-year push to get people out of their cars. Although Dutch riders are discovering the downside of ebikes when they’re forced to pay an average of 500 euros for new batteries. An Aussie writer says open season on bike riders is just insane, as the shooting of a 72-year old man riding on a bike trail appears to have been a random attack for no other reason than he was on a bike. More turmoil from Malaysia, where a bike rider was arrested following a scuffle with police during a protest over the impounding of illegally parked bicycles, despite a shortage of bike parking; he faces up to two years behind bars if he’s convicted. Meanwhile, the city government admits damaging a delivery rider’s bike when they impounded it. Yes, you can take your bike on the subway; no, you’re not supposed to ride it. There’s more than one way to carry a dog on your bike. Or back. And at last, cold-weather gloves for two-fingered bicyclists. That AB is a great start. I’d like to see a good definition for a non-shareable lane though. Texas, for example defines one as less than 14′ width or one that’s not wide enough for a vehicle and bicycle to share side by side. They also have a law allowing two abreast. It wouldn’t hurt to see a reference to CA’s 3′ passing law too in this part of the vehicle code. Here’s the TX code for those who are intersted. Hey, a more interesting fact about the 24 Hour Pueblo Race than Armstrong and his cohorts entering was that the team that beat them for 2nd place was a bunch of teenage amateurs from Sierra Vista, AZ. I just think that’s awesome.